What did you do with your CB500 today? Re: What did you do with your CB500 today? On a whim I took my bike to me MOTed this afternoon - the MOT isn't due until next month, but I thought I'd be ahead of the game and get it done a month early. I hadn't checked the lights etc as I everything was working last time I used it; of course this meant that it failed. The f*cking horn didn't work! Aaaaaaaagh! Chainsaw boots, 1 piece rubber suit, then the viking over trousers and jacket, 1 pair of gloves taped to the rubber suit then another pair ontop of them also taped up, then a welding helmet with replaceable perspex incerts, oh and ear plugs. I work with water flowing at 26 Liters a minute coming out of a hole which is 0.85mm wide, at over a velocity of 1,500 MPH . Which is about the size of a 500ml bottle of coke a second, vaporises on impact. Means you get soaked with ph13 water (after it's hit the concrete) if you don't wear the gear. Any chance to try and collect the bolt through the oil drain hole with some sort of magnet on wire. Running an engine with a dropped bolt somewhere inside sounds scary to me. I would strongly recommend getting the loose bolt out before continuing. Just taking the sump off may be needed. It's not what you want to hear I know, but a loose bolt bouncing around an engine or worse the gearbox could potentially seize the unit at any time. I ignored a rattle in a gpx750 at many years ago and thought that 'I'll get around to it' after 3 days and fortunately at tickover warming up the engine suddenly stopped. It turned out to be a bolt from the camshaft sprocket had come out and jammed between the crankshaft and the cam chain. The chain snapped and locked up the crankshaft good and solid. Three of the pistons and 12 of the 16 valves were also wrecked. Engine damage aside, had it been at speed!!!!! All of a sudden taking the sump off to retrieve your wayward bolt seems an easy task. It's straightforward, you may find it easier to take the exhaust off and certainly drain the oil. In fact draining the oil and using a small magnet through the hole may be worth trying before removing the sump. The sump pan is held on by only the bolts around the outer edge of it, once you see it you'll understand. Yes, I wasn't being serious. What is/was the temperature up in cairngorm? Fixed the horn. It now goes 'meep' as it did before, so it's not much better than no horn, but it should pass the retest. Just in case anyone else has this problem: I'm pretty sure that my horn had partially stuck with the internal contact open, so a bit of careful pushing on the round bit and removal of rust that was trapped underneath made it spring back into life. I could have fixed this without taking anything apart, so if your horn looses it's meep then it's worth a bit of poking to see if you can restore it. +3 to -4 wind was gusting to 70mph on one evening. Red cb500s in waitrose car park 1 New Union Square, London SW8 5AJ anyone on here? A bit light in the wallet by 8.30 this morning. Went to pick my CB up from the dealers after a 64k service, coolant change, new front tyre and pads. The bike is transformed though - why is it that I don't notice how crap the ride has become as it reaches it's 4,000 mile service limit? I've been assured that more financial pain is ahead in 2019 though. The front disk has now reached its limit, so will need swapping for a new one at 68k - as will the exhaust headers. These are suffering from terminally heavy corrosion where they meet the cylinder block. The front brake could do with a master cylinder rebuild really too as it's become progressively more spongy over the last six months - and the 18 year old rubber hose on the front probably needs to be changed for something a bit newer while that's being done too! On top of that the valves will need doing when it goes in at 68k (last checked at 52k when the cam chain was changed), so it will be bang on the 16k interval. Still, I've got until May (when the clicks hit that mileage) to save up for it so, as long as we haven't all gone to hell in a handcart because of Brexit, I guess I'll have had the time to pawn everything else I own by then. Looks bloody freezing, even for a supposedly hard Northerner ! Sitting in a villa in Mauritius at the moment (holiday). Flying home tomorrow into Gatwick, then 8 hour drive home to Newcastle. Been 31 degrees C here for the last 2 weeks. Not looking forward to it. Tell you what. There's some mad bikers in Mauritius. Mostly all on 125's (mostly Honda's, Suzuki's and chinese imports). They make filtering an art form, generating space where before there was none. And if they cannot, then they just beep their horn continuously. 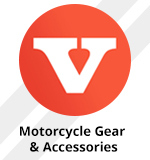 It's probably the first thing they check is working on their MOT (if such a thing exists) - which by the standards of some of their bikes, I doubt it. However, their motorcycle accident death stats tell you everything you need to know. As the tank and all panels are off for new paint I decided to go for a carbs cleanup and valve clearance check. Carbs were stuck so used a 1 meter pipe as a lever against the frame inner member to get them out, luckily not breaking anything. Next the heater assembly bowls were stuck and got damaged so I had to use a bolt extractor. The impact screwdriver I bough yesterday was also really useful. Pieces of the heater assembly joints would break off too. They were also clogged with some kind of slime. Finally one of the pilot screws broke off and is left in the carbs body, so it will be getting extracted too. That also means bying the more expensive full repair kit that contains spare pilot screws. Most of the rubber seals were as hard as plastic, o-rings squashed, there were remnants of the sub air filter inside the carbs as well as some big rust chunks - so it definitely was about time for overhaul. Sorry James, but when I look at that I wonder where you are going to attach the pom poms. I quite like it but with a black engine. It's almost Rothmans colours. Happy New Year to all fellow CB enthusiasts ! Took mine out for a shakedown today after the rebuild. What a job the rebuild was. When I stripped the bike, a bolt broke off on the water manifold that feeds the barrels, but enough was left so I could grip it with grips and undo it. unfortunately the remainder was stuck in the manifold and a piece of that broke off when getting bolt out but it has not stopped me from refitting manifold and so far there are no leaks. a stud broke on the exhaust, flush with the block so needed drilling out but when retapping hole the tap broke off in the hole so ended up drilling a fresh set of holes in the other two blanked areas, but this meant the distance between studs was less so exhaust clamp would not fit on so had to elongate the holes. 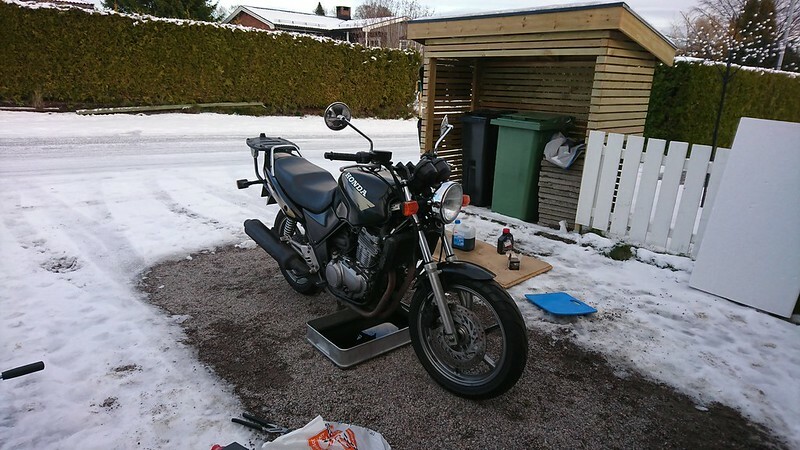 When bike was running it seemed to be struggling on tickover and flattened the battery ( alternator does not produce current below 1300 revs) 1, I had forgot to cover the vacuum spigot as I was using a improvised fuel tank so I could make any necessary adjustments. 2, it was only firing on one cylinder. 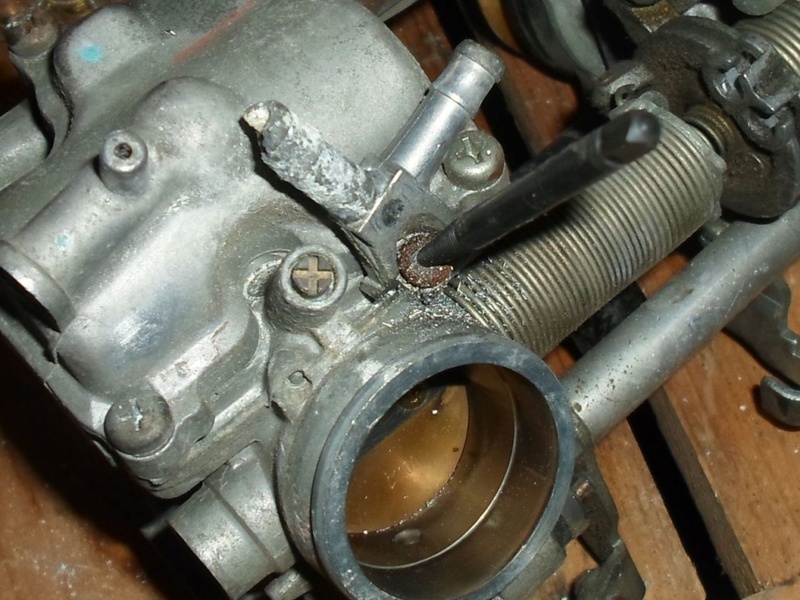 I had a cracking spark, on that side, and it jumped a hell of a gap to earth out, so it ruled out a failed coil but as soon as cap was fitted on to the plug in the engine revs dropped again, but pull plug off and let spark jump to plug revs pick up again! I got it to work by just moving the ht lead position. As already mentioned elsewhere on here I dropped a bolt in the engine , but thanks to Andyc's suggestion I got it out by taking off the sump. there was quite a bit of copper coloured detritus in the sump, but the oil filter was spotless. Anyway, bike runs ok, there is still a rattle that occurs when under acceleration but it goes when not under load. I'm not sure about the cooling, but now the fan cuts in when temp gauge reads in the middle, the hoses get hot, and I have pressure but I don't know if coolant is circulating correctly - I can see it circulating with the cap off though. 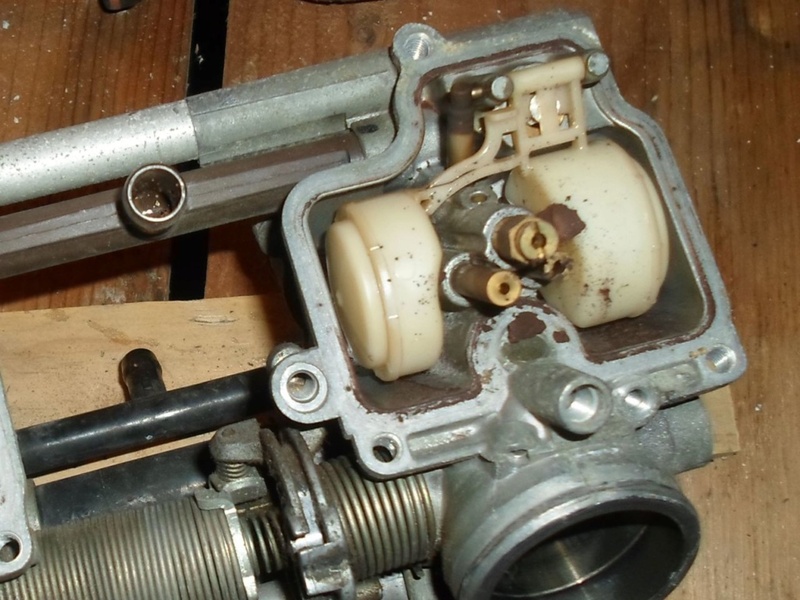 On a side note, I discovered it is easier to remove and refit the carbs and airbox whilst still joined together. Over the past cpl days....shims, oil and filter change, coolant sys fettled flushed and refreshed, helicoiled oil drain plug...was running almost perfect bar a tired battery and then made a mess of the carb sync ... a few niggles attended to and a new battery on the way.